Marnin girls! It's Saturday and I'm all caffeined up, waiting for Steve-O to get here to install my beadboard paneling. Still no stamping to show, but I thought I'd show you the progress on the red kitchen. It's coming along nicely! I was going to go all GIRLY on the chandelier, but decided on a brushed nickel kitchen-y look instead. I resisted the temptation to go all roses & shabby-chic to help the resale value of the house! 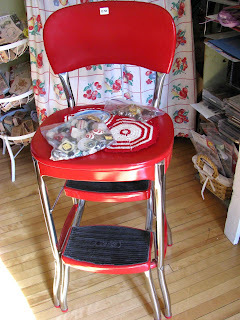 All of my red stuff is sitting around patiently waiting to be put back in it's place. 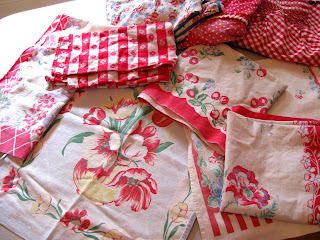 I was excited to see in Country Living that the hot new collectible is kitchen dishtowels. You can usually get them for under $10.00. (.50 cents if you're me!) I've collected these for years and always keep my eye open for the red ones! 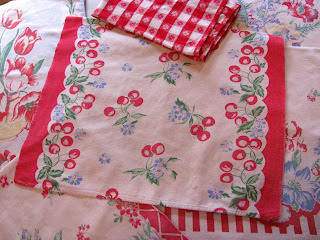 My favorite one is this sweet cherry towel! 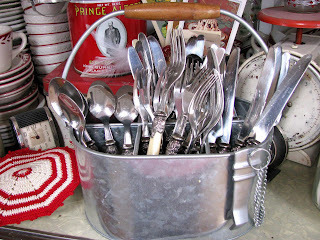 My everyday china is this vintage restaurant-wear. The dishes are indestructible and RED of course! I got the whole stack of plates, bowls and cups & saucers for $15.00 at a garage sale up by the cabin years ago. Have a cherry weekend, everyone! Okay, I'm not gonna lie. Today didn't start out so hot. I got to work today and while reading my emails was startled by a LARGE 2 inch cockroach staring down at me from my cubicle wall. After the first one was disposed of, I screamed like a girl after moving some papers and discovering his brother. Just so you know, I eat lunch at home, so it was NOT my fault, I do not have food at or in my desk! So today I had a parade of people stopping by my cube asking about my new pets. But I had a GREAT lunch hour! 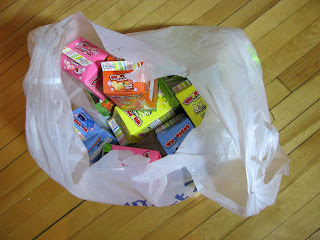 I LOVE the start of junking season! 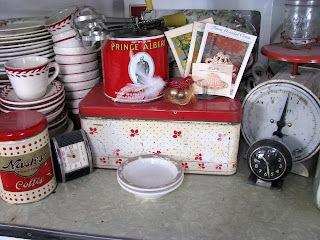 I hit a cool estate sale and scored some great treasures for my almost RED kitchen! I found this MINT stepstool for $12.50 and it is EXACTLY like the one I remember from my Grammie's kitchen (hers was yellow)! There is not a DING on this thing! I couldn't resist these sweet little stripey pot-holders, which were never used! I may want to hang them up somewhere and not use them because the lacey crocheted edges are just the sweetest. I also scored a bag of interesting kitschy buttons (also some are mother of pearl). 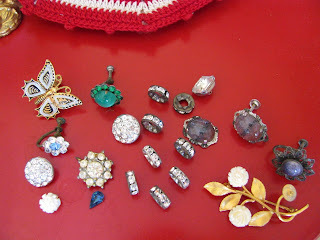 I also picked up a bag of broken junk costume jewelry on the cheap. 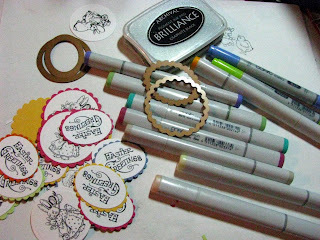 These will find their way onto my cards for one-of-a-kind embellishments! Look at these sweet red floral buttons. 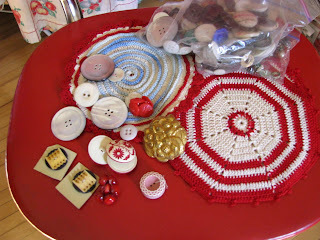 I'm hoping I can find some fun fabric and have my Mom make some pillows for me with these buttons in the center. I walked away after paying $15.50 for the whole adventure! YIPPIE! 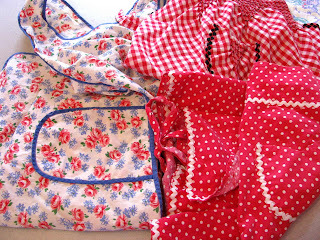 It was a good JUNKIN day, in SPITE of the cockroach meeting at 8am! Hope you have a bug-free Thursday! 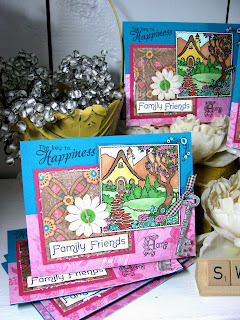 I am seriously stamping challenged this weekend! 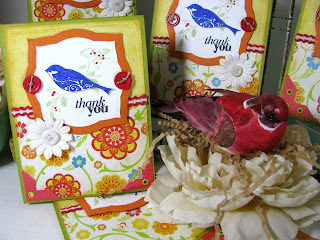 I did manage to stamp out some simple thank-you cards, but I'm mojo-less in a big way right now! It may have something to do with the state of chaos that my kitchen is in! 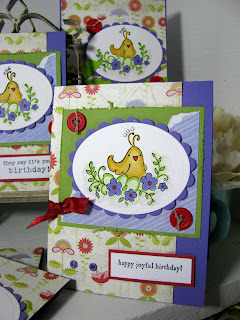 I pulled out my trusty Die Cuts with a View Citrus stack this weekend and hoped the fun paper could carry my cards this time, as I was was not in a putzy mood; I wanted simple an quick! I pulled out a new Inkadinkado set I got at Michaels called 'Birds Galore', and then stamped the simple bird and vine image for my focal point. 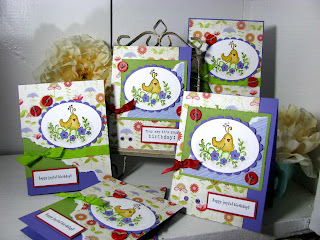 I stamped the blue birds separately so that I could cut them out and pop them off the cards for more dimension. The floral paper is glittery in real life! 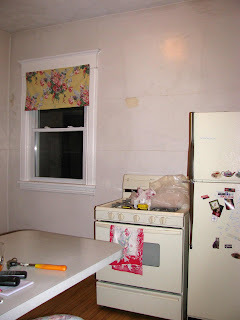 Just so you know what's sucking the mojo out of me, I thought I'd post a photo of my dilapidated kitchen that I've been living with for 10 years. My house was built in 1909 and parts of it are in desperate need of remodeling. My kitchen project is going to be done on the CHEAP. 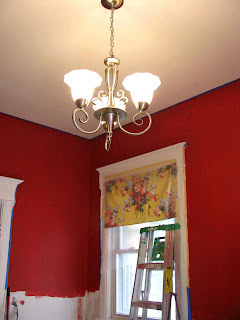 I hired a guy to skimcoat my kitchen walls & ceiling so I can paint it and update it. 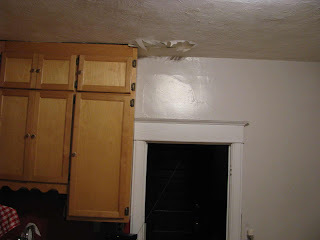 Plaster chunks are missing & the kitchen was painted a horrendous light mauvy pink color. Soon it will be replaced with my favorite color, red! 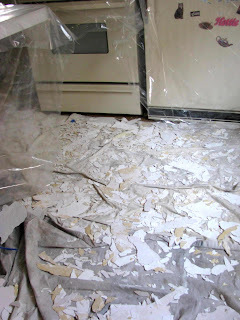 The demolition of the ceiling is now finished, and I spent today painting primer on the walls and ceilings. I'll definitely show you the 'after' photos when all is complete! Hope your weekend was uhm, cleaner than mine! 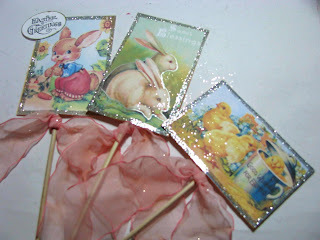 Tonite I thought I'd post some sample cards I made for Crafty Secrets to send out to scrapbook stores. I've been putzing on these for the last 2 weeks, doing bits and pieces of them here and there whenever I have free time. 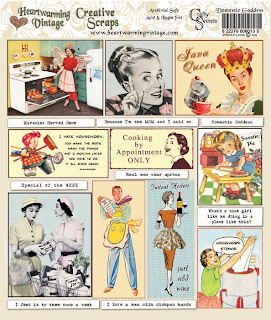 I'm having my kitchen walls re-done, so this week has been a flurry of moving stuff out of the kitchen, and shopping for light fixtures and building supplies. 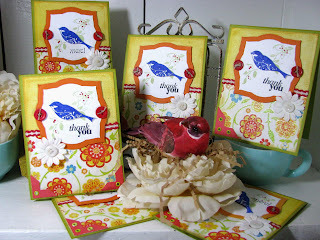 I can't WAIT to get back to cardmaking and creating! 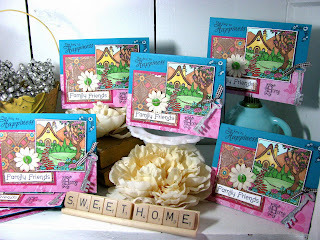 These cards were done with Crafty's "Home Sweet Home" stamp set. I colored exactly 25 of these sweet little home scenes, including all of the little flowers on the tree! I plopped a Kaiser white paper flower off to the side to make this card extra flowery. 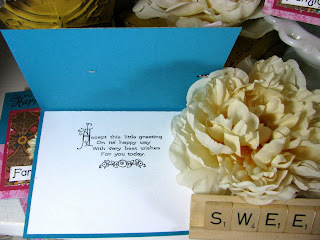 The card inside reads: Accept this little greeting, on it's happy way with very best wishes for you today. I wish you happy weekend greetings! 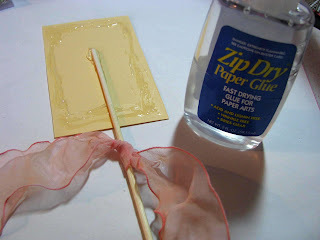 I'm going to make one of these for myself that says "HOME DUSTY HOME", since the wall sanding will begin on Friday! Happy weekend, all! 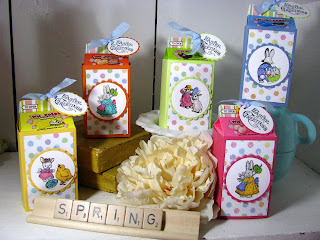 Procrastinator girl here again, with a quickie Easter gift idea for you! I threw these together tonite after work. 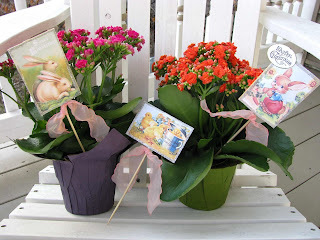 I grabbed a couple of these beautiful potted flowers at the grocery store, (Kowalski's if you live in the Twin Cities.. $7.99 each!) 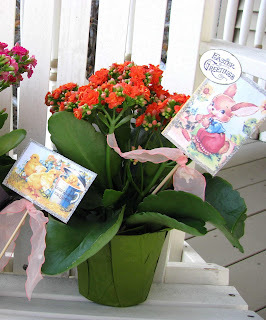 and I wanted to dress them up with a cute pick so that they'd look a bit fancier than, uhm, grocery store plants! 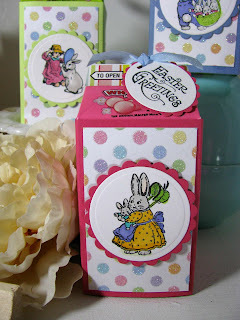 I dug into my sheets of Crafty Secrets Easter-themed Creative Scraps and ran a glue pen's width of glue around the edge of the cut-out image. 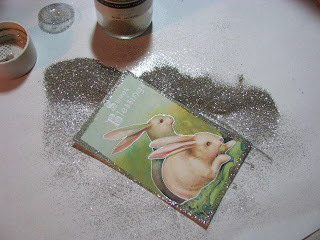 Then I dumped Martha Stewart white-gold glitter to the edges to give it sparkle. 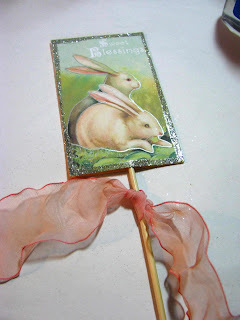 Next, I took some wide organdy ribbon scraps (these were from Michaels' $1.00 spot) and tied the organdy to the skewer. I quickly ran my heat gun along the edges of the ribbon, which melts the ribbon and makes it ruffly! That's IT! DONE! 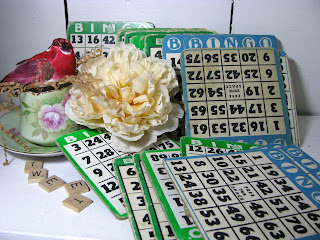 10 minutes each; 15 if you're screaming at the kids or hubby at the same time! I also took a silver gel pen and outlined the bunnies for extra shimmer, but this step is optional! Keep it easy! Here's what they looked like after I was done with them. They look like they took forever, but seriously, I did them all so quickly, Mom and Grams will NEVER know how LITTLE time I put into these! Hope you have a peaceful, happy Easter full of friends and family! Happy Saturday morning, everyone! I'm happy to be home today, putzing around cleaning and getting ready for a birthday celebration at my house for my BFF Janine! J. and I have always been a week apart for birthdays, so we combine the 2 and celebrate them together. Tonite we're having a low calorie FIESTA that will include tacos, skinny margaritas & Hungry Girl low-calorie 8 layer dip. I'm prepping all the food today and my house smells like a big ONION! I whipped together a fun card for her this morning; I got my shipment of Crafty's new "Creative Scraps" a while ago and just haven't dug into them yet like I'd like to! 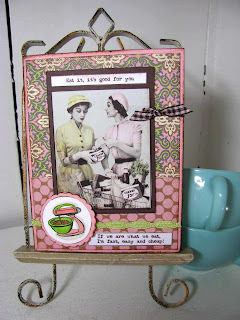 I used an image from the "Domestic Goddess" Scraps to create this card. I can't believe how cheap these are; they are retailing for $3.50! You can totally CRANK out 10-15 cards for the price of ONE! I reached for these first because they are so quick to slap a card together with. On this card I also used the little mixer image from Crafty's "Sweet Stuff" stamp set for a little round corner embellishment. I had to use the sentiment "If we are what we eat, I'm fast, easy and cheap"! 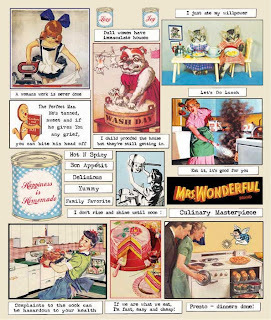 You can mix and match any of the sentiments to create your own personal sassy card! The scraps come on a double sheet folded in half, so the front of the scraps is the image above, and the back of the scraps has more images! I'm counting 14 cards out of these now! DUH! He leaves big fuzzy cotton-ball dust bunnies for me to clean up. YUCKO. 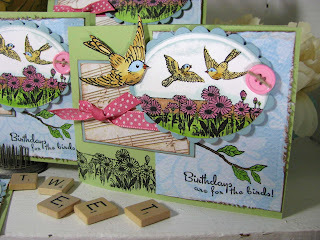 I was on a Unity roll last weekend so I thought I'd post more cards I did using the spring flower birdie from Unity's "Birds of a Feather" stamp set. After coloring a bunch of these in, I figured out that the green loops under the yellow birdie are probably supposed to be Easter eggs, for Easter cards! Oopsie, I colored them in green thinking they were twirly vines! Dual purpose, right? 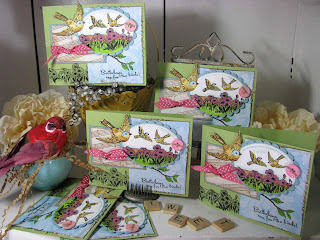 I think it's so much fun that on each of the birds in this set, there are always 2 or3 little whimsical dots above their heads or on the flowers. 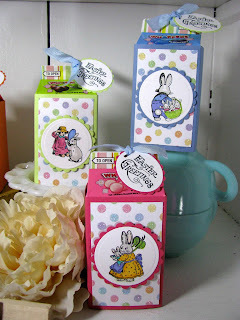 I've been adding tiny rhinestones to them to make them sparkle and add whimsy to these sweet images! Has spring sprung in your town yet? 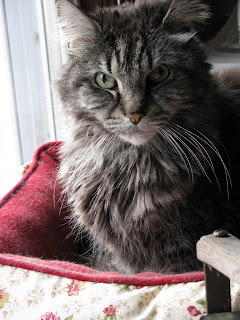 We're getting snow here but it is GOING AWAY AND MELTING! Yay!